Photo: side by side, A Brain Cell vs. the Cosmos. 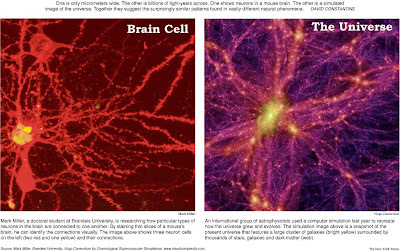 Physicists find that the structure of a brain cell resembles amazingly to the simulated picture of the entire universe. Left. Brain Cell. Mark Miller, a doctoral student at Brandeis University is researching how particular types of neurons in the brain are connected to one another. The image shows three neuron cells of mouse's brain and their connections. Right. The Universe. An international group of astrophysics used a computer simulation last year to recreate how the universe grew and evolved. The simulation image is a snapshot of the present universe that features a large cluster of galaxies (bright yellow) surrounded by thousands of stars, galaxies and dark matter. to them that this is the Truth.
. Interesting Read: The Bible, the Qur'an and Science: (La Bible, le Coran et la Science) The Holy Scriptures Examined in the Light of Modern Knowledge, by Maurice Bucaille. Available for Online read via Witness Pioneer.